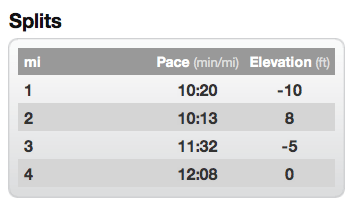 To be honest, those splits are looking pretty good for how I was feeling. I can’t say that I know what a hangover feels like but I had my on version Sunday morning : bloodsugar hangover. My bloodsugars were a mess on Saturday and into Sunday morning – super high, super low. Usually you can roll with the punches but sometimes when it hits you it knocks you out. Plus my food choices /treatment weren’t the wisest. It was a smaller group at the UGS / Athleta Run on Sunday. So when the intermediate group was set below a 10 min pace I considered dropping back to the beginners knowing that I didn’t want to push myself on this run. But I didn’t. Being a smaller group, we all stuck together instead of splintering into smaller groups. Until I dropped back….far back. Like had to give in and walk by mile 3. I was half way around the reservoir and knew I wasn’t going to catch up and had to listen to my body. I wanted to throw my (empty) water bottle, I wanted to cry, I wanted to stomp my foot (not so easy while you’re shuffling along). After finally being pain-free while running my bloodsugars decided to take their turn. It happens. Bad runs happen. A lot. For some more than others. I met one of the coaches at the end of the loop and she was nothing but supportive but I definitely threw myself a pity party getting there. Luckily I was able to shake it off as we left the park and I really understood how much it’s going to take outside of the runs to make this work. Categories: Uncategorized | Tags: 6/17, athleta run club, bad run, bloodsugars, central park run, Group run, morning run, splits, stats, Sunday run, UGS, Urban Girl Squad | Permalink. Categories: Uncategorized | Tags: 6/17, feuling, Group run, morning run, Sunday run | Permalink.